THE CHEAPEST CAR BECOMES THE MORE EXPENSIVE Tata Motors introduced a striking and exclusive version of the economic Nano. Is this the world's cheapest car? No, if it is bathed in gold. The Tata Nano is the cheapest car of the world because its price is just around $2,500. With this model, Tata intended that Indian drivers change their motorcycles for four-wheeled vehicles. However, sales have not been as high as the company wanted, so to get the attention of new buyers, they launched a unique special edition. It is a model with 22 kilograms of gold, 15 of silver and different precious stones embedded. This flashy version of the Nano was introduced in Mumbai and the design was elected by a contest. Those in charge of creating this version of the Nano were the workers of Titan Industries, a subsidiary of Tata focused on the watchmaking. Besides drawing the attention of car buyers, this is a way to celebrate 5,000 years of the Indian jewelry business. The lines and shapes that this Nano has, reflect in a good way the culture of India. With this model, Tata Motors intends to improve sales of this economic model, but besides showing this edition they announced a four-year warranty for all models. 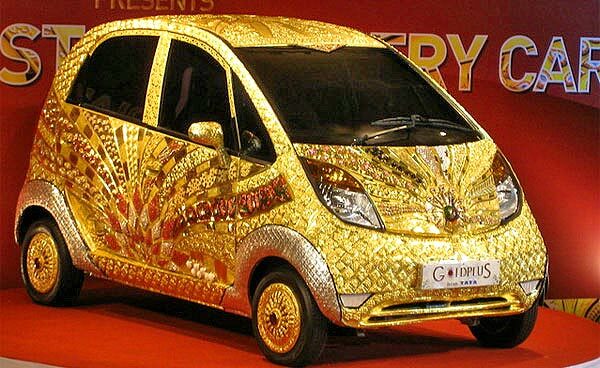 Video: The cheapest car of the world, the Tata Nano, bathed in gold.